This wall is predominantly vertical and offers a good variety of climbing in more moderate grades than the Monster Wall. Watch for loose rock and expect some grit. 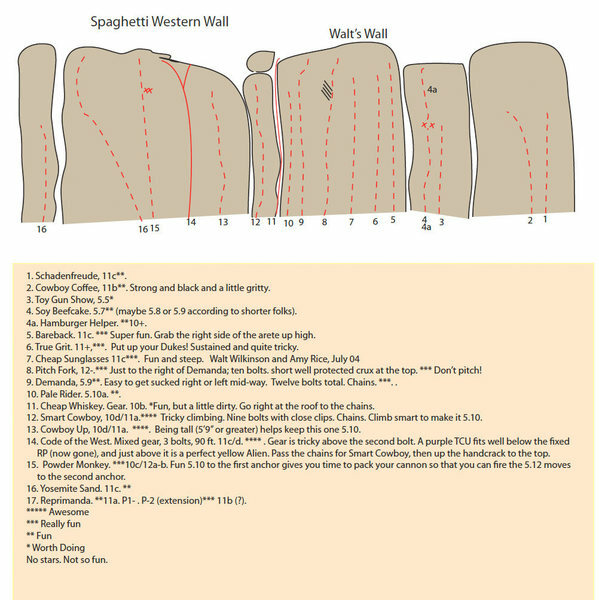 Overview of the Spaghetti Western Wall area as of summer 2008. .
Spaghetti Western Wall is about a quarter of a mile downstream from the Monster Wall. You can also get to it by hiking up from the fishing access pay parking area on SR4, though you'll have to do a bunch of stream crossings. Consider downloading the beta drawing for overview info. ● Today We Climb...Tomorrow We Die!